I haven’t tried ALL the Thai restaurants in Charlotte yet – I’m still working on that! – but I believe I have found my new favorite! I’ve always heard mixed reviews about Monsoon, but I’ve been curious to try it – especially since voters rated it so highly in the 2013 VegCharlotte Awards. Upon arrival, I understood one reason for the mixed reviews. 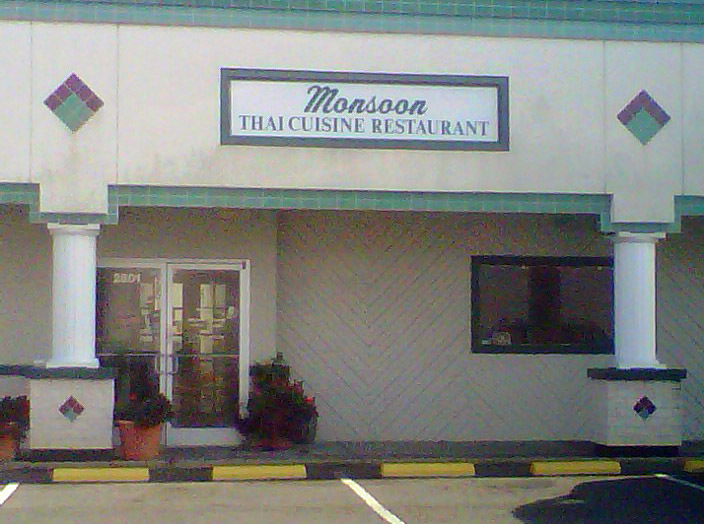 Monsoon is located in a small strip center on South Boulevard, close to Healthy Home Market. It’s not a bad neighborhood, exactly – more industrial. But it’s definitely not a swanky, upscale area like Ballantyne. And from the outside, it looks completely unprepossessing. The signage blends in with the rest of the center. It’s your classic little “hole in the wall” restaurant. 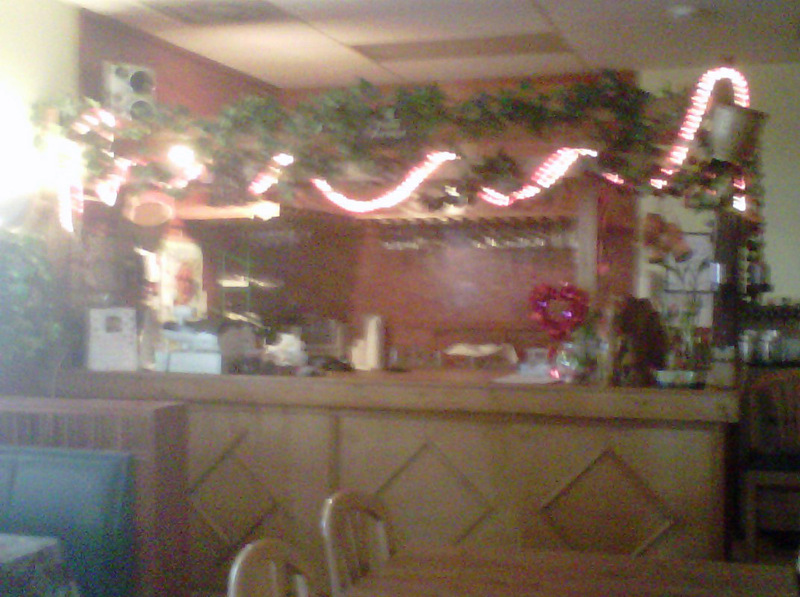 However, I know a lot of people DON’T like hole in the wall restaurants, especially in Charlotte. They want something shiny, trendy, new, slick. The inside of Monsoon looks better than the outside. It’s larger than you would expect (with both booth and table seating) and looks pretty much the way you want a Thai restaurant to look – colorful fake flowers, strings of white lights, “romantic” framed prints of Thai couples. The lunch menu is EXTENSIVE… probably close to 20 items instead of the standard 5 – 7. My dad and I both ordered stir fries. 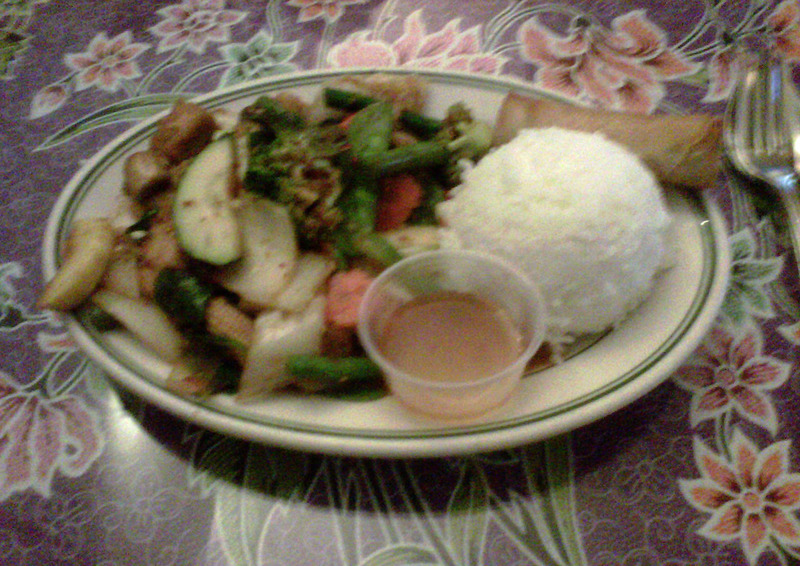 I ordered the Pud Prig Pow (sauteed onions, carrots, baby corn, bell peppers, and basil in roasted chili pepper sauce). Spice is on a 1-3 level – mild, medium, or Thai native. Of course, I ordered mine Thai Native. The waitress didn’t even blink! My dad (who cannot tolerate spicy food, AT ALL) asked our friendly waitress for advice, which she cheerfully gave. She even offered to leave the onions out of his stir-fry for him. Speaking of the waitress – service was excellent! (I’m beginning to notice a trend in Thai restaurants – service is usually over-the-top terrific or over-the-top horrible). We also had several servers checking on us throughout the meal. And the food? AMAZING. My food was actually brought to me Thai Native (hot enough to open my sinuses and make me sweat a little!) But … BUT … Sometimes when you order food “hot,” the heat is the only thing you can taste. Not so at Monsoon! The dish had a very deep, rich flavor that the heat complemented, not overwhelmed. It also had enough tofu. I’m not a big tofu lover, but it does make a dish more substantial, and for some reason restaurants often skimp on tofu. Why? – Tofu is one of the cheapest ingredients out there! The vegetables were very fresh and still a little crunchy (and mixed with fresh basil leaves). The chef added some broccoli to my stir-fry (which wasn’t listed in the menu description) but didn’t appear to “short” me on my baby corn or mushrooms – two ingredients I love. Pud Prig Pow. This Crackberry snap doesn’t do it justice. Meanwhile, my dad was able to enjoy his stir-fry dish, which was indeed mild enough for his comfort. 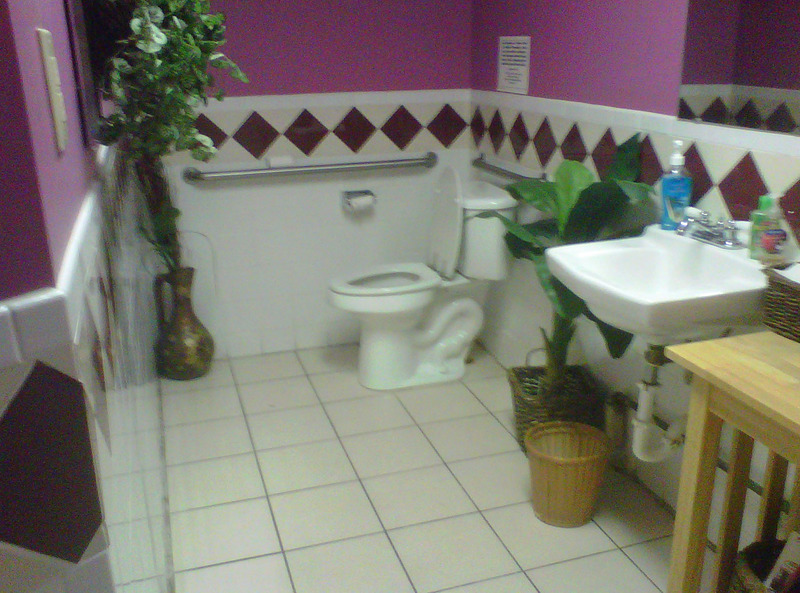 Monsoon Powder Room. Very clean. 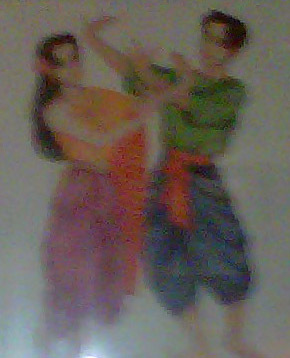 Before deciding it’s my “new favorite Thai place,” I HAD to go back and try a curry (Kang Panang). Yuuummmm … Once again, the spice notes were perfect. Fresh basil and lime leaves. Rich complex flavors that weren’t overwhelmed by the heat. Traditional Thai food at its best. Bottom Line: IF you are open to hole-in-the-wall, nonglamorous restaurants, and IF you prefer your Thai food to be spicy and authentic rather than mild and “Americanized” – please give this place it a try! It might become one of your new favorites, too! One Location: 2801 South Boulevard, Charlotte, NC 28209. 704-523-6778. Lunch 11:00 AM – 2:30 PM, Dinner 5:00 – 9:30 PM Monday – Thursday, 5:oo – 10:00 Friday & Saturday. Closed Sundays. Your reviews make me want to move to Charlotte:) “hole in the wall places have the best food”, that’s been my experience too. If you ever visit Charlotte I’d love to meet up with you! Charlotte is a great place and it’s really got a lot of options although most people here are very focused on flash and appearances and “keeping up with the Joneses.” People here either love all the little independent funky spots or … they love Ballantyne. Yes, always check and double check! Oyster sauce definitely is an issue and something new vegans don’t think about. I often say I’m allergic to shellfish if I’m in a new restaurant. I’m fortunate, though – Charlotte is experiencing such a vegan uprising that many Thai (and Indian) restaurants are taking advantage and making their food more vegan-friendly. Last time I was at Thai House, I ordered a vegetarian dish and before I could ask about oyster or fish sauce, the waiter asked if I was vegetarian. When I said yes, he told me they would not use any fish sauce, that the gratis soup had chicken so I shouldn’t eat it, and that he would substitute a vegetarian spring roll for the regular spring roll. I must say, that was very refreshing!